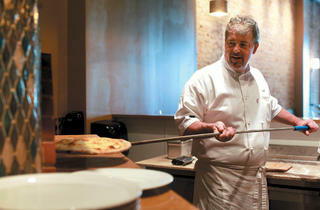 Photograph: Sally Ryan Chef proprietor John McLean removes a white pizza from the wood-fired pizza oven at Sono Woodfired. These confused—but elated—exclamations from my friends continued for the first five minutes or so after we sat down at Sono Wood Fired, choosing a table near the back of the super-simple, brick-walled room for the warmth of the gleaming, namesake hearth. 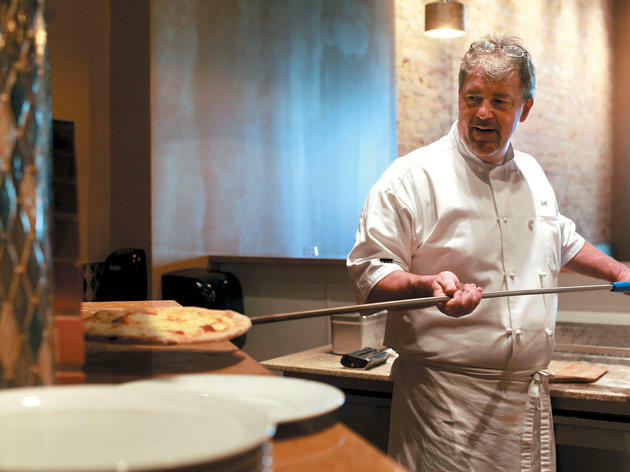 Sono is a pizzeria, and yet no one was getting excited about the pies. And as it turns out, that instinct is spot-on, as the main event was ultimately the most forgettable thing we ate. Vaguely Neapolitan in form but not so much in flavor, the dough was missing the slight tang, the chew and the good dose of salt I’ve come to love at other successful wood-oven pizzerias around town. The crust was almost crumbly in texture, somehow a bit grainy, with nothing very distinct about it. Thinly sliced rosemary-laced potatoes on the Sardinia pie were both flabby and fairly raw (not a good combination when layered onto another starch); hunks of fennel-flecked Italian sausage and roasted red peppers fared better as toppings, but the tomato sauce slathered beneath them lacked punch and depth, just lying there like sad stuff poured from a jar. Still, that trio of mozz we started with was a more-than-generous portion of tangy slices made from buffalo milk, cubes of decent fior di latte and a fist-sized knot of burrata oozing with cream. Alternating swigs of wine (from a respectably interesting list, no less) with bites of the cool cheeses, a beautifully bright eggplant caponata and feathery, perfectly fried artichoke leaves, we realized Sono might in fact have something to offer—it’s just not pizza. El stop: Red to North/Clybourn. Bus: 8, 9, 33, 72, 132. THE BEST pizza in the city hands down. They have a brick oven, farm to table ingredients and a warm staff. So good we eat here once a week! Great location right off the Red Line, Great ambience and the best pizza in the city. Now there are open for lunch and what awesome wood fired sandwiches to go with their salads and flatbreads. The decor is so warm, the service is perfectly inviting and the food as wonderful. My favorite Italian and wood fired pizza anywhere. Oh my..... their Aged Ribeye steaks are sinfully good. One of the BEST steaks that I have Ever had and I have had a lot of good steaks in my life. It practically melted in my mouth. The food and service is exceptional! I love that they are open for lunch now too! You want the best wood fired pizza in Chicago then get in here and taste this spectacular food. Any pizza is perfect and they have great fresh warm mozzarella on wood toast with oil that is so delicious. I just found out they are open for lunch, try the Italian Wood Roasted Grinder or the flatbreads and you will be glad you try them.